Product prices and availability are accurate as of 2019-04-24 21:05:04 EDT and are subject to change. Any price and availability information displayed on http://www.amazon.com/ at the time of purchase will apply to the purchase of this product. A Rainbow of Sweet Bell Peppers in Every Packet! Each color has its own distinctive flavor! Here's what you get--white, yellow, orange, red, lilac, purple, and chocolate! 65 to 70 days. 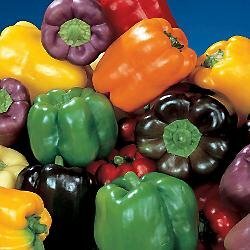 Now you can enjoy sweet bell peppers in all the glorious colors and flavors available today--without paying expensive supermarket prices for "gourmet" peppers or buying half a dozen packets of seed! We have hand-blended, exclusively for Park customers, a mix of the finest variety of each color. Consisting of 6 hybrids and 1 open-pollinated type, this mix assures you of big, thick-walled, blocky bells in every color. We selected not only for appearance but uniform harvest time and superb disease resistance, so these varieties all mature within a week of one another and are vigorous garden performers. Economical and downright exciting, this is--in our opinion--the finest mix of sweet bells available anywhere!